I’m way, WAY behind schedule in posting my reading wrap-up for 2016, but here it finally is! Overall, I had a really fantastic reading year–I discovered a bunch of authors that I want to read more and more from; I was able to pick up new books from writers that I already love; I listened to way more audiobooks than I ever thought was possible for me; I expanded the range of genres I tend to read from; and I had a lot of fun, which is the most important part. 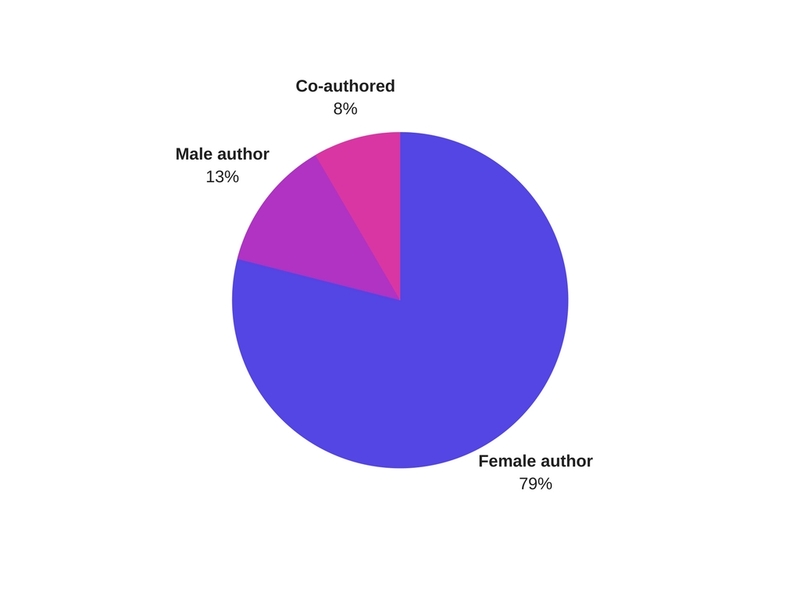 % of books by female authors: 78.9% – I think I almost always tend to read more female authors than male in a given year, but usually I think I hover around 2/3 female authors. This year, I hit almost 80%! % of Adult Books: 80%. 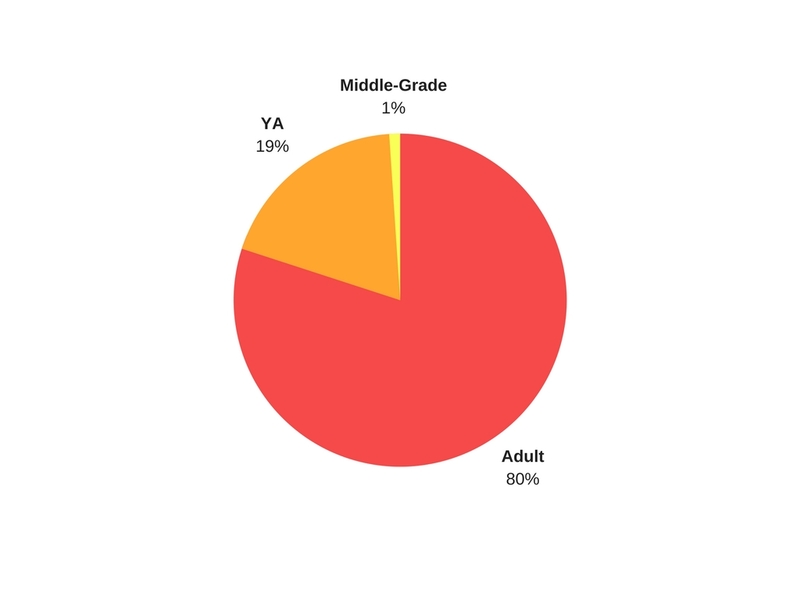 I wanted to include this in my stats because I was curious how much YA I was actually reading; sometimes I feel like I’m not reading enough adult literature, but the pie chart doesn’t lie–I’m clearly reading adult books the vast majority of the time. Books by format: Print books (75%) still comprise the vast majority of my reading, although I definitely added a lot to my reading totals by getting into audiobooks. ✓ 18. Read a book that was adapted into a movie, then watch the movie. Debate which is better. Here they are, after much debating and an awesome year of reading…the ten best books I read in 2016! To be clear, these weren’t all published in 2016, although a few of them were, and they aren’t necessarily ranked in order of how much I loved them. My favorites of 2016 include an essay collection, two short story collections, a historical fiction novel, a retelling of a classic novel, the next book in one of my favorite fantasy series, a beautiful science fiction novel, the first book in a sensational quartet, a genre-bending story with dual narratives, and a collection of poetry. I read a LOT of books this year, and it was hard to choose just ten to represent all of 2016, but these books all touched me in some way, and I’d highly recommend them to everyone. The Obelisk Gate by N.K. Jemisin (5 stars) – this is one of the rare cases where the second book in a series is just as amazing and mind-blowing as the first. N.K. Jemisin always impresses me, but the world she’s created in the Broken Earth trilogy is so fully realized and its characters so engaging that this has become my favorite fantasy series of all time, and it’s not even over yet. Bad Feminist by Roxane Gay (5 stars) – this essay collection was so good that I had to buy my own copy, since my first reading was from a library book. Roxane Gay discusses feminism, racism, pop culture, and her life in a way that’s complex yet very accessible. It’s a book that I can’t wait to start lending out and will need to re-read myself at some point in the near future. I’m anxiously awaiting her memoir about her relationship with food, Hunger, which comes out in 2017. The Girl Wakes by Carmen Lau (5 stars) – I loved every page of this book. It’s a very short collection of microfiction focused on dark fairytale retellings with feminist themes, and it’s amazing. I found it at a small press book fair last spring, and I hate the fact that if I hadn’t noticed its enticing cover on a table, I might never have found it. Reading this book really highlighted the importance of reading small press and lesser-known books, because there are incredible things to be found. The story that lingers the most in my mind is about a girl in a relationship with a vampire, but it’s not a romantic, Twilight-esque story; the vampire barely has the strength to stand, and the girl continuously murders people in order to bring him food. The shocking things that she does and the way her life descends into darkness mirrors the trajectory of an abusive relationship, and it’s shocking, heartbreaking, and extremely memorable, despite lasting only a few pages. The Passion by Jeanette Winterson (5 stars) – this was one of the first books I read in 2016, but it’s endured as one of the very best. This was also my introduction to Jeanette Winterson’s writing and made me want to read everything she’s ever written. It’s beautifully crafted historical fiction that follows a young man who joins Napoleon’s army and a bisexual Venetian woman, both becoming entrenched in different types of passion that may or may not consume their lives. It’s about the nature of love and obsession, and it’s heartbreaking yet beautiful. And the prose is just gorgeous. The Long Way to a Small, Angry Planet by Becky Chambers (5 stars) – this book hits almost every note that I look for in science fiction: the writing is wonderful, the focus is on character-building and the interactions between different types of beings in a complex universe, Chambers hits upon universal themes yet approaches them in a unique way, and the world-building is detailed and well-thought-out. I’ve found a new favorite author in Becky Chambers, and I’m currently reading the companion novel to this one, A Closed and Common Orbit, which is also wonderful. 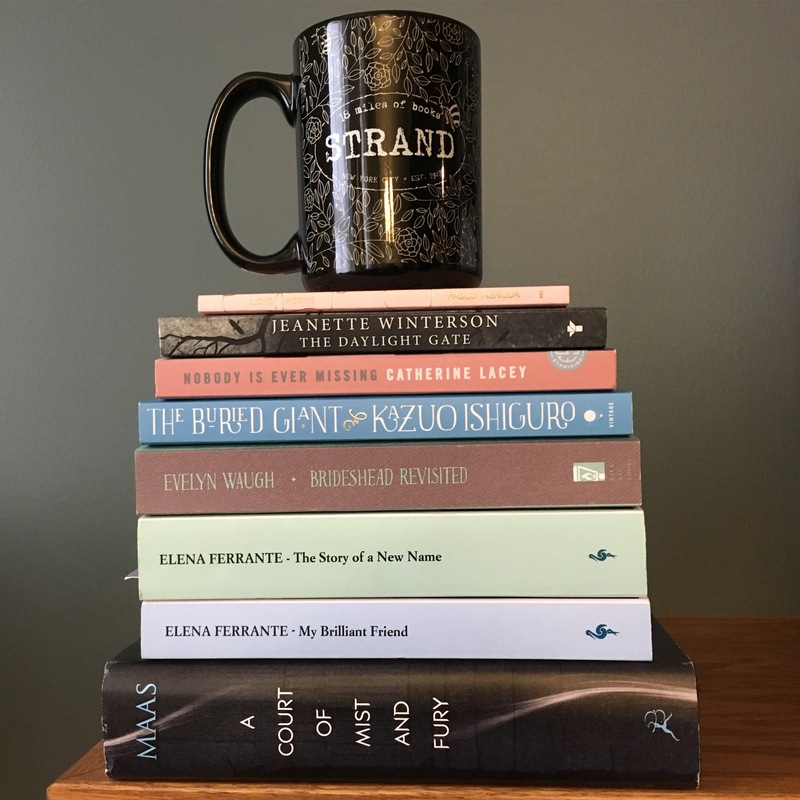 My Brilliant Friend by Elena Ferrante (5 stars) – I was so skeptical about Ferrante’s work, but I understood the hype almost immediately after I picked this up. The storytelling is beautiful and artful, and the focus in on two fully realized characters and their fraught, complicated relationship. It’s not at all my typical type of book, but it didn’t matter, because this book was so completely absorbing and addicting. Wide Sargasso Sea by Jean Rhys (5 stars) – this retelling of Jane Eyre from the perspective of Mr. Rochester’s wife made me completely rethink the entire story and its narrative. The prose is dense and lush and you feel like you’re falling into a trance every time you pick up the book. It’s bold and profoundly disturbing, intensely feminist, and it completely blew me away. Read it. Just read it. Mr. Splitfoot by Samantha Hunt (4.5 stars) – this 2016 new release is about cults and ghosts and family and love, and it’s told in this wonderful dual narrative that builds more and more tension throughout the book, ultimately culminating in a can’t-put-it-down finale. Gutshot by Amelia Gray (4.5 stars) – This short story collection was completely, perfectly weird. A lot of the stories are microfiction, which I am a huge fan of because it depends on the author being able to cram a ton of meaning and emotion into only a few pages. I was not expecting to be so impressed with this collection when I picked it up, and now I’m planning on reading much more from Amelia Gray in the future (I’ve already picked up a copy of her novel Threats). The most striking stories in this collection included one about a giant snake that appears and physically divides a town in two, which highlights its already-present divides, and one about a woman trapped inside a house’s ventilation system. Milk and Honey by Rupi Kaur (4.5 stars) – This is my preferred style of poetry to read – short poems in free verse with huge emotional impact. The middle two sections of this book absolutely blew me away. I read each poem at least 2-3 times because it’s impossible not to savor her words. This is the type of book I’d absolutely re-read, and you can’t help but feel deeply when you read Kaur’s words. So, there they are! I’d love to hear about your favorite books of 2016–let me know in the comments what yours were and if any of them overlap with mine! I’m currently working on my reading goals for 2017 and debating with myself on how I want to focus my reading in the coming year. I’m almost overwhelmed by the sheer amount of books on my TBR and I feel like I want to read everything at once and dive into a million different directions. But before the 2017 reading extravaganza can begin, and before I post my full-on 2016 wrap-up post (because 2016 isn’t over yet!) I wanted to look back and see how I did on the reading goals I set for myself for 2016. So, here they are: my 2016 reading goals, and whether I succeeded or failed on these eight different challenges. Reading Goal #1: Read more long books. I definitely didn’t pick up every long book on my TBR shelf in 2016 (not even close, actually), but overall I didn’t do too badly on this goal. I did read a bunch of longer books, although those did tend to be fantasy and/or YA, which are faster reads for me, and I didn’t challenge myself by reading any long classics or anything like that. The longest books I read in 2016 included The Wise Man’s Fear by Patrick Rothfuss (1107 pages), A Court of Mist and Fury by Sarah J. Maas (624 pages), Gemina by Amie Kaufman and Jay Kristoff (659 pages), and Mistborn: The Final Empire by Brandon Sanderson (647 pages). Complete failure on this goal. I read zero classics in 2016 (I mean, I read Charlotte Perkins Gilman’s short story “The Yellow Wallpaper,” published in 1892, but I wouldn’t count that as a full book) and I’d say I read very few “older” books. The oldest books that I did read in 2016 were Love Poems by Pablo Neruda (pub 1952) and Wide Sargasso Sea by Jean Rhys (pub 1966). Um. Well. 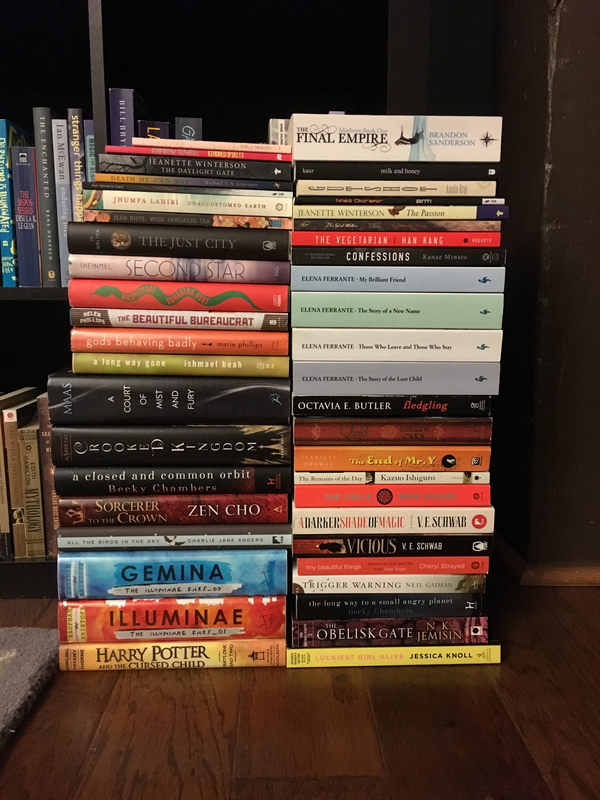 I did read a pretty decent number of books on my physical TBR shelf, but I also bought a LOT of books this year, so a dent was definitely not made. This goal was a tricky one; basically I wanted myself to not hold back from picking books that would be challenging yet rewarding, and not default to picking up silly books that I already sort of assumed in advance would turn into lackluster 2-star reads. I think overall I did better at this in 2016 than I did in 2015, but I think that in terms of those challenging-yet-rewarding books I hope to do even better in 2017. I’d say that this goal was a success! 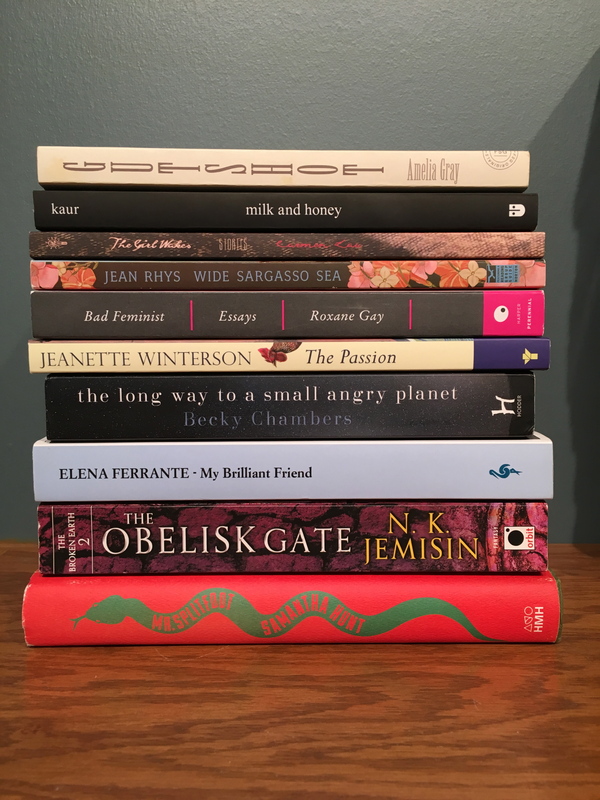 New favorite authors I discovered in 2016 include Amelia Gray, Jeanette Winterson, Becky Chambers, Jenny Lawson, Carmen Lau, Elena Ferrante, Samantha Hunt, and Cheryl Strayed. I think I did pretty well at this goal; in 2016, I picked up books by previously-loved authors Kazuo Ishiguro, Octavia Butler, Leigh Bardugo, Sarah J. Maas, N.K. Jemisin, Jhumpa Lahiri, Seanan McGuire, Patrick Rothfuss, and Neil Gaiman. Success! I participated in both rounds of Dewey’s this year, and they were both wonderful. Again, success! I read subsequent books in these series in 2016: the Kingkiller Chronicles, the Broken Earth trilogy, the Court of Thorns and Roses series, and the Six of Crows duology. Do you set reading goals for yourself? How did you do on your 2016 goals? Let me know! Reading Updates: Halfway Through 2016! Since we’re halfway through 2016 (what??? how??? ), I wanted to look back over my reading and see how I’m doing so far this year. Overall, it’s been a really great year for reading–I’ve had 6 five-star reads so far this year, and due to my extreme pickiness, I’m really happy about this. Last year, I only had 4 for the entire year. I feel like overall this year I’ve done a better job picking out books, and I hope that I can continue the good-books streak for the second half of 2016. How am I doing on my goals for 2016? Well…let’s see. Read more classics. I am doing very poorly on this goal; unless you stretch the definition of “classic,” I really haven’t read a single one. Wide Sargasso Sea, a feminist reinterpretation of Jane Eyre written in the 1960’s, probably comes the closest. Read more books by authors I know I love. I’m doing well on this goal so far, having read books by already-favorites Kazuo Ishiguro, Neil Gaiman, Octavia Butler, and Seanan McGuire. Read more long books. I’m doing OK on this one; I think the longest books I’ve read so far have been The Wise Man’s Fear and A Court of Mist and Fury. I’d really like to get in a few more doorstoppers before the end of the year, though. Read at least 50 books. I am crushing this goal–it’s only halfway through the year and I’ve almost hit 50. Read more books I think I will love, compared to books I will just like. This goal basically meant that I didn’t want to read as many filler-type books that I sometimes pick up because they’re readily available at the library, or cheap, or to get out of a reading slump. I haven’t read any 1- or 2-star books yet this year (!) so I’d consider this a win. I also have 6 5-star books already, which is high for me as I’m super picky about rating books with 5 stars. Participate in at least one Dewey’s Readathon. I participated in the Readathon in March, although because of work, my participation wasn’t as intense as I’d have liked it to be. But I’m definitely going to participate again in October. Also, the #24in48 readathon is at the end of July, so I’m excited for that. –Actually read at least one classic, for reals this time. –Finish Book Riot’s Read Harder Challenge. And…I also wanted to look back at my top ten books for the first half of 2016! I wonder how many of these will end up on my top ten list for the whole year? I guess it depends on how my reading goes during the second half 🙂 The first six of these were 5-star reads (or almost, and rounded up to 5 stars) and the other five were excellent 4-star reads. How is everyone’s reading going so far this year? Reading challenges are a relatively new thing for me, but they’re something I’ve gotten more and more interested in the past few years. Last year I participated in quite a few, and even finished one or two of them (Goodreads Challenge and Read Harder 2015). I also started a lot of others without finishing, but still had fun trying. Let’s see what I can accomplish this year! Goodreads challenge: read 50 books. This is lower than last year, when I shot for 60, because I’m planning on tackling a bunch of very long books this year and don’t want to feel pressured. Colorful Covers Challenge 2016: I love this challenge, mainly because it ends up looking really pretty. Basically, you challenge yourself to read between one and three books (I tend to shoot for three) with covers in every color of the rainbow and also black, white, gray, brown, and multicolored. Science Fiction and Fantasy Reading Challenge: from the Science Fiction and Fantasy Book Club on Goodreads, my challenge this year is to read 12 science fiction and/or fantasy books that this group selects to place on its shelf. I’m in the middle of my first book for this challenge, The Wise Man’s Fear by Patrick Rothfuss. 2016 Goodreads Choice Awards Reading Challenge: this one’s from a group I’m in on Goodreads–I’m trying to read 20 of this past year’s Goodreads Choice Awards winners and nominees between this year and last year. I’m already at 14! Book Riot Read Harder 2016 Challenge: I participated in the Read Harder 2015 challenge this past year through Book Riot, a fantastic book blog that I’m addicted to, and found it a really fun way to branch out in my reading. This year’s challenge looks a little more challenging, but I’m still definitely planning on completing it. 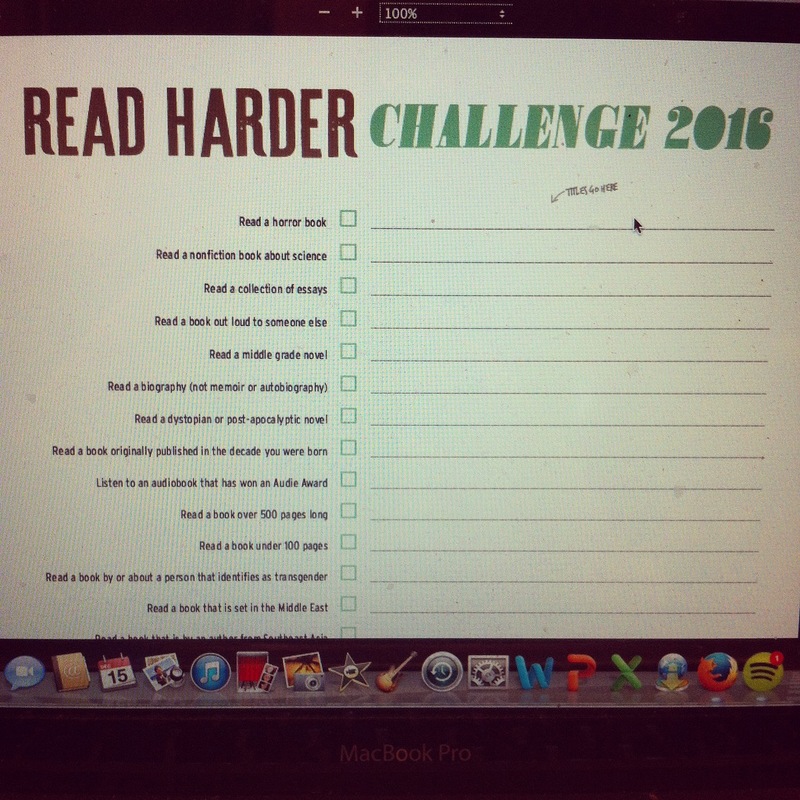 2016 Popsugar Reading Challenge: There is no way that I will accomplish this challenge. There just isn’t. But hey, I’m going to give it a shot anyways. #BustleReads Challenge 2016: I probably will not finish this challenge, although I’m noticing that this overlaps a lot with last year’s Book Riot challenge…and a bunch of other challenges…according to the list, they actually did this on purpose, but maybe that’ll make it easier to finish. Although it’s not a high priority for me compared to the other challenges. 1. Read a book written by a woman under 25. 2. Read a book on non-Western history. 3. Read a book of essays. 4. Read a book about an indigenous culture.